Imagine entering a restaurant or club in the evening. The light is dimmed, but you can see a landscape of light dots. These 'light dots' (diodes embedded into the chairs) inform if any seats are available, or if your favourite area of the club is busy. 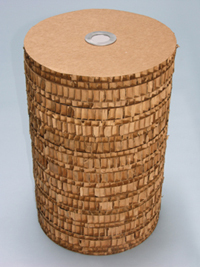 These cardboard stools were a spontaneous bi-product and, well known to many students, a good means for procrastination. Their making was inspired by the many pieces left-over from cutting cardboard for the tables. I cut 12" cardboard rings on the laser cuter and placed them one on top of the other. I used a plexi tube as a stacking rod. I made a small, battery-operated circuit with ultra-bright LED, and placed it inside the tube. Aluminium rings with vellum glued on plexi was placed on top of the plexi tube. The vellum is translucent and diffuses the light. 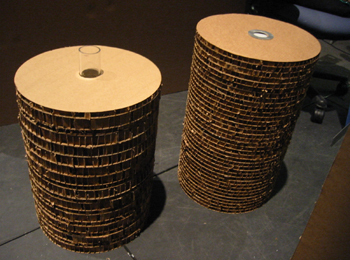 The stools are made from honeycomb cardboard (1/2" and 1") rings cut using laser cutter, 1-1/4" plexi tube and aluminim rings cut using water-jet cutter.